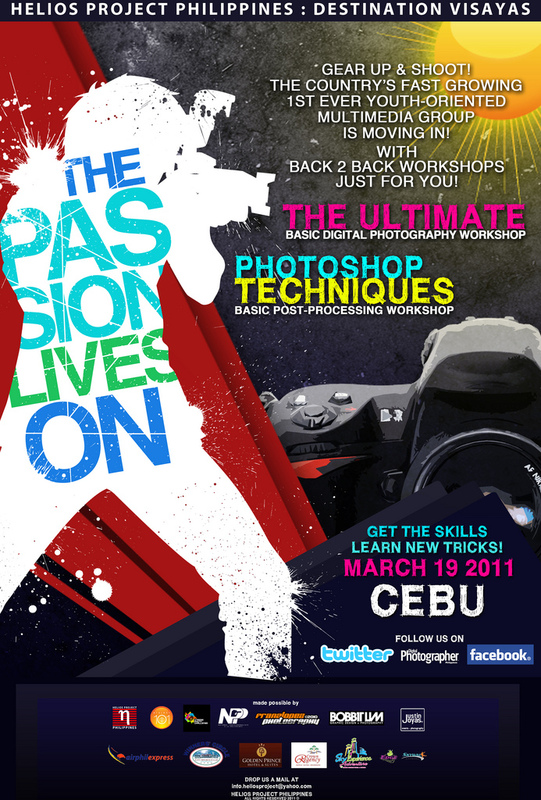 Participate in the much awaited Cebu Photography workshop of the year!! Itinerary and full workshop course guide briefer out now! Register your name, address and contact number to info.heliosproj@gmail.com. Deadline of payment is on march 10 2011. Hurry! Limited Slots Only. See poster or PM me for details (ym: j_ypee). 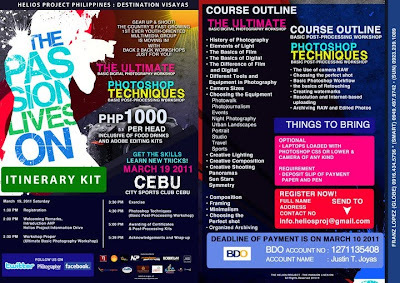 Calling all aspiring and budding photographers from Cebu. 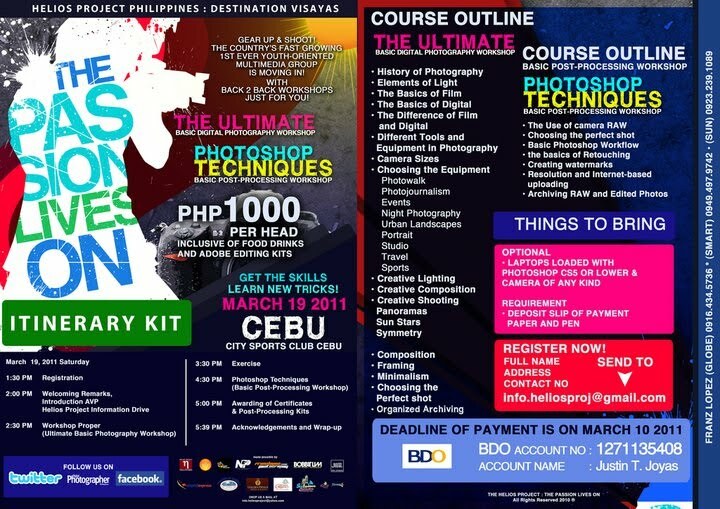 We, The Helios Project Philippines, a team of photographers and visual artists based in Manila will be holding a photography workshop on March 19 2011. The back to back workshop will cover Basic Digital Photography and Basic Post-processing Techniques. Time and venue to be announced soon. We'll see you there! See photo for details. The Helios Project International, is the fusion of various Forms of Art and Mass Media with Photography as the Soul that binds these arts into one. Founded on August 17, 2008 as one of the first Youth-Oriented Organizations to focus on multimedia, the Helios Project is composed of talented individuals pursuing their passion for the Arts. Our Perception of this is in CREATING the ultimate multimedia GROUP composed of Photographers, Models, Fashion Designers, Multimedia Artists, Advertisers, Make Up Artists, Film Makers, Writers and many more. This new breed will conceptualize on different forms of Digital Imaging into ONE holistic, organized body and revolutionize the realm of Digital Arts on its way into Breaking the new era of Digital Imaging.